Recently we heard from folks in several locations who wanted to offer microscopic hair analysis for their customers. This make sense because hairs are pretty narrow so any kind of visual analysis requires a microscope. These entrepreneurs want to provide consultations based on their microscopic analysis of hairs that customers provide them. 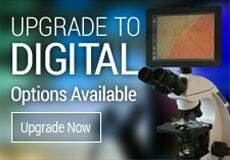 Being microscope experts, we thought we would help these hair experts out by working through which microscope system, objective lenses and camera combination would best perform that job. Obviously, high-end research microscopes and other kinds of microscopes such as Scanning Electron Microscopes (SEM) can provide enormous amounts of detail, but those are way too expensive for most folks who want to start a hair product and analysis business. Given that, we first had to decide between a stereo microscope and a compound microscope. 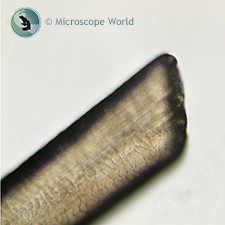 The stereo microscope provides a lot of working distance, but because you can only get about 90x magnification (after adding a 2x auxiliary lens) you don't get much hair shaft detail. Hair shaft detail is what is required for proper hair analysis. Combine this with the fact that a stereo microscope usually costs more than compound microscope, we decided the stereo microscope is not the best fit for the hair analysis field. 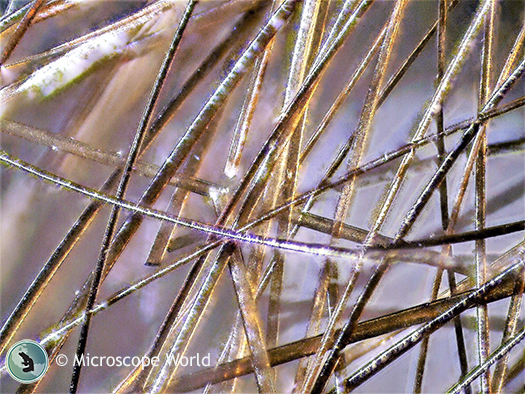 Hairs captured under the FZ6 stereo microscope at 5x using extended depth of focus software. We started looking at compound microscopes. First, we started off with a Richter Optica HS-2D high school digital microscope. This is a solid microscope, aimed mostly at high school level education, and comes with a small microscope camera, all for under $1,000. We found that, although it is a nice microscope for high schoolers who use it maybe half an hour a day, every few days, the kind of detail needed by the hair analysis professionals requires stronger illumination and a higher-octane camera. Next up we moved to the Richter Optica UX1. This lower-level University microscope has a stronger LED light and a sturdier frame (16 lbs. versus 6 lbs). 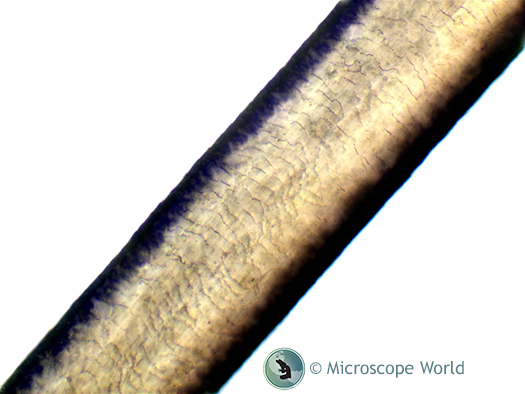 We took a look at a hair plucked fresh here in our office under a 10x and 20x lens (that equals 100x and 200x total magnification respectively, with the 10x eyepieces). These were fine, but again, hair analysis folks we have spoken with say it's all about the detail. 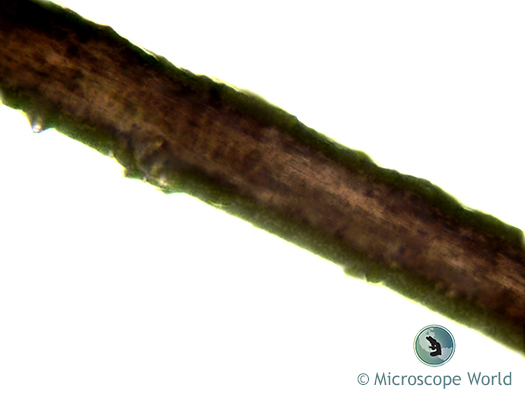 So we moved up to the 40x Achromat lens, which gave us a really good look at the hair shaft. We added a very nice 3.2 megapixel camera and started capturing images of the hair, changing focus from the bottom of the shaft up to the sides, and then to the top of the shaft. These images are shown below. 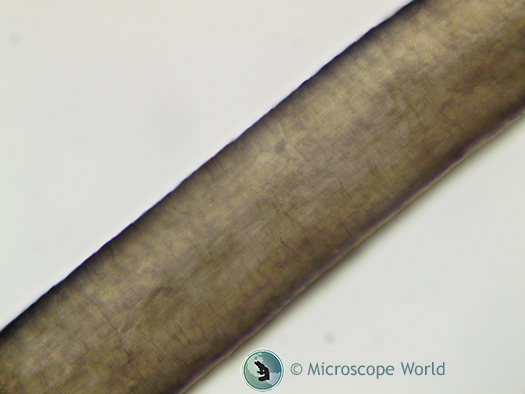 Hair shaft under the hair analysis microscope at 400x focused from the bottom of the shaft. 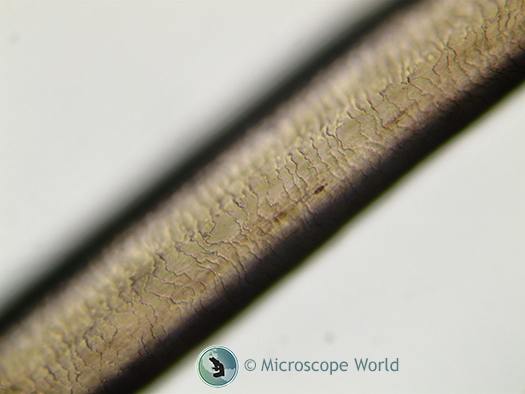 Hair shaft under the hair analysis microscope at 400x, focused from the middle / sides of the shaft. 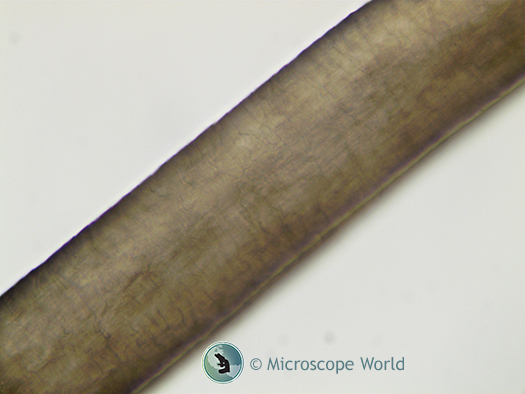 Hair shaft under the hair analysis microscope at 400x, focused from the top of the shaft. 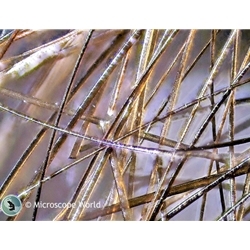 This hair shaft image was captured at 400x using the hair analysis microscope and extended depth of focus in the software to combine multiple single-shot images at different focal depths into one in-focus image. Again,we are microscope experts and not hair experts, so we can't say what the detail within the picture tells us (although it looks like healthy hair to us! ), but the hair analysis folks we have spoken with agree that this image has good detail required for hair analysis and determining the health of hair. To give you an idea of the different types of hair analysis, the image above is an African American hair captured with the hair analysis microscope at 400x using extended depth of focus software. The other images captured were a Caucasian hair. In the end, we packaged up the best, most cost-effective hair analysis system that we used in our test run and created the hair analysis microscope package. If you are planning on getting the system and intend to make measurements using the camera software, you are going to need a stage micrometer to properly calibrate the software with the microscope for measurements. If you have captured images of hair we would love to see them, send us an email! 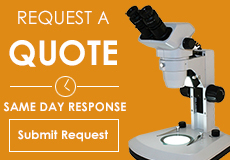 Additionally, if you have questions regarding hair analysis or the microscope system we used, contact Microscope World and we will be happy to help.